Special thanks to the community of Illuminaudi Cards, Cincinnati, for sending in photographs, videos and information on the tournament to our editors. 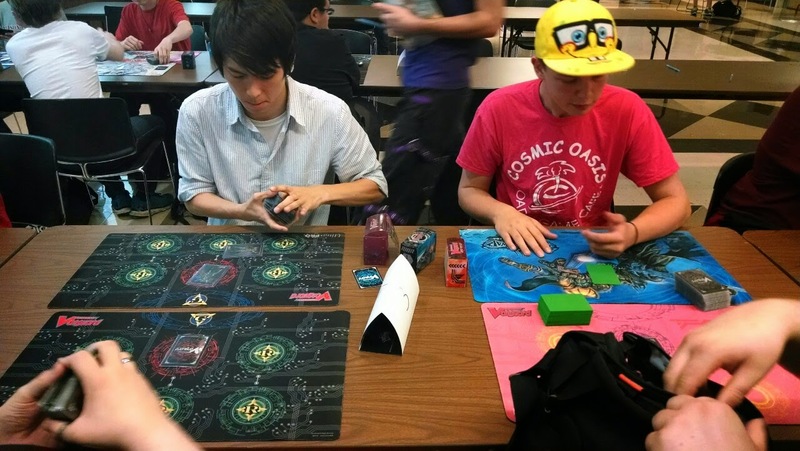 This past weekend saw a medium-sized American fan tournament take place at Meeple Fest in Richmond, Kentucky, an unusual sight in a country where professional play primarily revolves around shop tournaments and Bushiroad's official events. 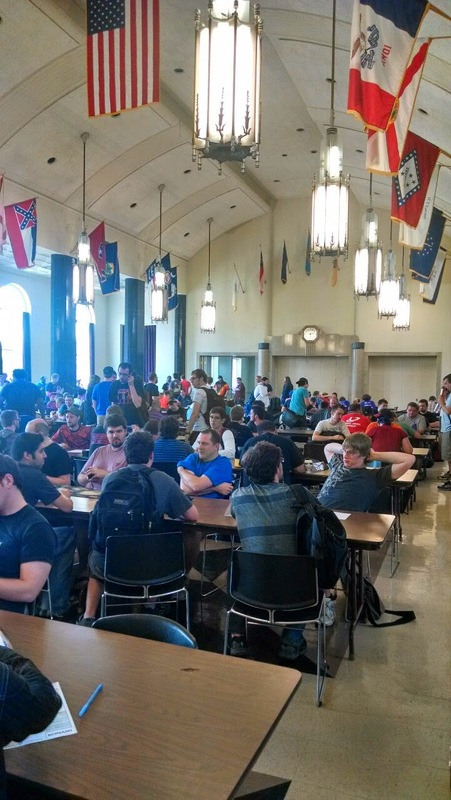 Organized by Ron Flickinger of card shop Cosmic Oasis, the tournament was held at Eastern Kentucky University, and had a turnout of 19 persons. While these are relatively small numbers on a global scale, within the United States where fan-organized tournaments are in their infancy the turnout is respectable, and was more than four times the turnout of CO's previous tournament. The event was held in a best of three format, with five rounds of Swiss pairings between the entrants, followed by a cut to top 8. Bushiroad was supportive of Oasis' efforts, providing the tournament organizer with Creeping Dark Goat promotional cards (previously exclusive to World Championship 2013) and exclusive official deckboxes for distribution at the event, which were given to each of the participants during the fifth round. 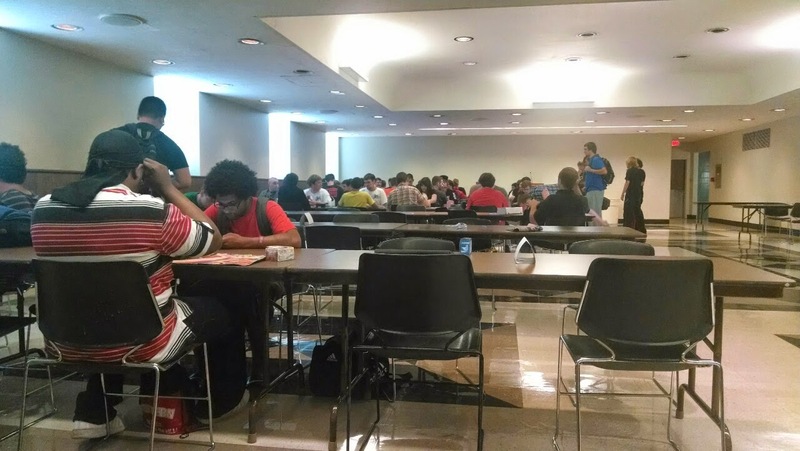 Those who made it to top 8 were awarded either a quantity of booster packs or a cash reward of equivalent value at their own discretion, with the prize pool increasing based on the number of participants. Each player paid a $20 entry fee, with first place earning two booster boxes, the top 4 receiving other prizes in descending value, and the entire top 8 receiving official playmats. Because each pack was valued at $2 rather than the $3.99 standard embraced by most American card shops, participants could get considerably more value out of the tournament than normal. Judging was handled by a combination of volunteer players, and on-site judges from CO to prevent any favoritism. Flickinger's tournament was met with an overwhelmingly positive reception, and a followup tournament is currently scheduled for the next Meeple Fest on September 6th. The tournament finals were recorded by a viewer and submitted to Cardfight Pro for hosting, and can be viewed below in two parts. As both participants were already satisfied with their results in making it to the top spots, the tone of the fight was considerably more laid back than is often seen in professional play, particularly in comparison to Bushiroad's regional tournaments where the difference between first and second place is a paid trip to the national finals. The two competitors had briefly discussed the possibility of splitting their winnings, before opting to play it out. These final games were between Link Joker cardfighter Alexander Wilson playing Chaos Breaker Dragon and a Kagerou cardfighter whose name we do not have permission to use, playing Dragonic Nouvelle Vague. Wilson had previously made a bid at professional play in the 2013 Stand Up Challenge Cup and Team League 2014, and had begun playing Chaos Breaker shortly before the Oasis tournament due to dissatisfaction with his performance using the Revenger series. He was in the minority however, as turnout at Cosmic Oasis saw just one other Link Joker fighter take part, using Nebula Lord Dragon, and five Nouvelle players in the tournament. In total the top 8 was comprised of Chaos Breaker Dragon, Dragonic Descendant, Aqua Force, three Dragonic Nouvelle Vague and two Gold Paladin fighters. In the first game, Wilson was immediately behind due to being gradelocked at 0 for a turn, but this was somewhat offset by an early critical trigger. A lack of strong aggression on his opponent's part and an early damage trigger prevented the gradelock from being capitalized on, but Wilson was also forced to open his grade 3 turn on Chaos Breaker Dragon rather than the preferred Infinite Zero. He came back by immediately shutting down his opponent's field, using Chaos Breaker's discard skill and Dust Tail Unicorn to Lock both frontrow rearguard lanes, giving himself time to recover. A surprising and early double critical trigger could have potentially sealed it for Wilson, but his opponent healed out of the blow, and he was forced to stare down a 2 critical Blast Bulk Dragon that would restand with Dauntless Drive's breakride skill. Accepting a risk, Wilson allowed the first attack through so that he would go to limit break, used a perfect defense card to block Blast Bulk's second attack, and then activated Chaos Breaker's limit break in the end phase to replenish his hand. With Colony Maker he was able to even out the situation considerably, matching his opponent one-for-one in card advantage, but on the final turn his opponent found an opening by gambling on two triggers to break through Wilson's defense. He made the correct play in assuming that Wilson would be able to guard a rearguard with two triggers on it, and took his one chance to end the game by applying the effects of his first trigger to his vanguard without knowing if there would be a second one. As the loser of the previous game, Wilson chose to go first in the second one. Forgetting Mobius Breath Dragon's skill, his opponent was caught off guard when Conroe was Locked going into his second turn, which made his grade 2 vanguard easier to defend and limited the options available on that turn. Several timely heal triggers become defining for the rest of the fight, keeping the Nouvelle fighter at a more sustainable damage count over time. Once again Wilson had to open his grade 3 turn without Infinite Zero, forcing him to eventually repeat his shutdown play from the previous game to Lock both frontrow units one turn later. The Nouvelle fighter's persona blast is where the game definitively turned around in his favor, taking four of Wilson's units down for the price of one, leaving Wilson at -6 and his opponent at -5 advantage. Nouvelle's guard restriction skill, preventing Wilson from using grade 0s to defend, forced him to drop two successive perfect defense cards over two turns, and DNV's 13000 power base also forced him to ride Infinite Zero Dragon later on just to be able to connect a hit with the vanguard. The lack of a breakride on the following turn severely hurt Wilson's ability to recover, and this snowballed quickly because of a double draw trigger on his opponent's end. While his last turn break riding Chaos Breaker over Infinite Zero left Nouvelle attacking totally alone, the number of cards under his control was so low by that point that CBD was likewise attacking by itself, and DNV in general has a much better time acting as an independent vanguard than CBD does. Ultimately the Nouvelle cardfighter was able to check one of the last two critical triggers remaining in his deck, and while Wilson pulled a sixth damage heal, its effects were nullified by Nouvelle's skill. Where Cosmic Oasis was dominated by DNV fighters, the story was considerably different on the other side of the pond, as the third BeNeLux tournament concluded last Sunday in Antwerp Belgium on the 22nd with only a single Nouvelle Vague in the running. Unlike previous BeNeLux tournaments, this month's competition used a combination of tagfight and Invasion rulesets, where each team of two cardfighters acted as a pair sharing one damage zone (capped at nine cards for a game loss) while also being restricted in deck choices. Like in Team League 2014, any pair on the Invading side using Link Joker or “Яeverse” cards was not permitted to use deck options outside of these, and any pair on the Defending side did not have access to Link Joker or “Яeverse” units. A total of 30 persons took part in the third BeNeLux, divided into 15 teams. Exact clan turnout is uncertain, but the decklists of the top 2 teams were graciously submitted to us by the second place team. First place in the tournament was taken by the team of BeNeLux organizer Tom Staes. Staes is well known in the community as a devout Aqua Force cardfighter, and for one particular combo with his first vanguard Bubble Edge Dracokid wherein he sets Bubble Edge's skill on the grade 2 Tidal Assault in the backrow, and uses the grade 1 Wheel Assault to move the Tidal from the backrow to the frontrow after three frontrow units have attacked, allowing Tidal to use his own skill to create a fourth and fifth battle; this triggers Bubble Edge's draw skill twice during the fourth and greater battles, helping to overcome Aqua Force's consistency problems by building a high hand size on the second turn.